I'll be directing the Champlain Philharmonic in their Fall 2016 series, which features Middlebury College Student Gareth Cordery performing Tchaikovsky's Piano Concerto No. 1. Also on the program are Tchaikovsky's Capriccio Italien, Borodin's On The Steppes of Central Asia, and an excerpt from Prokofiev's Romeo and Juliet. A collaboration between myself and chefs Trevor Sullivan, George Lambertson, and Jean-Luc Matecat, presented by the VSO, Arts Riot, and Pingala Cafe. The evening will feature pairings between homegrown music, food, and drink, with a VSO string quartet and a plated multi-course meal, inclusive of beer, wine, and liquor. Great music +great food = A fantastic evening. Tickets go on sale 9/1. As an ongoing partnership between Shelburne Farms and Burlington City Arts, “Of Land& Local: Watershed” combines the missions of both organizations and supports artist led conversations about social, ethical, and political issues impacting the Vermont landscape, culminating in exhibitions at both locations. Video from Between Land and Water, a site specific performance on Lake Champlain for which I composed and performed the music with Shannon Hawley, Jeremy Frederick, Adam Wood, and the South Burlington Community Choir will be reimagined as an installation in the Coach Barn at Shelburne Farms. The exhibition will be open from 10AM-5PM daily for the next month and contains a ton of great artists and work. Performances of Grab It and White Flag by the Dutch composer Jacob TV. 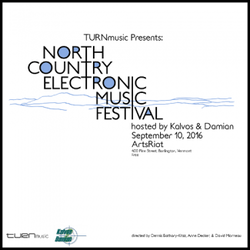 Come check out all the great electronic musicians from VT all day at Arts Riot. Admission is free.